As usual, so many good book suggestions on this round of Tell Me What to Read. I can hardly wait to dive in. Here are the three I’ll be reading over the next three (ish) months. It’s been too long since I read a good YA fantasy (to be honest, fantasy is not my genre of choice, although every now and again something blows me away, like Daughter of Smoke and Bone). This one gets killer reviews and I’m excited to dive in. Just have to make it through any maps at the beginning . . . This is by the same author as Secrets of a Charmed Life (which I haven’t read yet), but it’s brand-new and getting excellent reviews, and I’m always interested in books about the flu epidemic of 1918, since it’s one of my father-in-law’s areas of academic expertise and part of the class about World War I that I took from him when I was on study abroad in London more than 10 years ago. I’m already pretty sure this is going to be one of those books that makes me long for my beloved Austin book club. It’s non-fiction about death row and it’s won about every award you can imagine, plus when someone says “this fast-paced book reads like a John Grisham novel,” well this John Grisham fan isn’t going to say no. If I LOVE them, I’ll review them in here in detail, but no matter what, I’ll keep you posted over on Instagram and InstaStories. I’d love it if you read along with me! P.S. 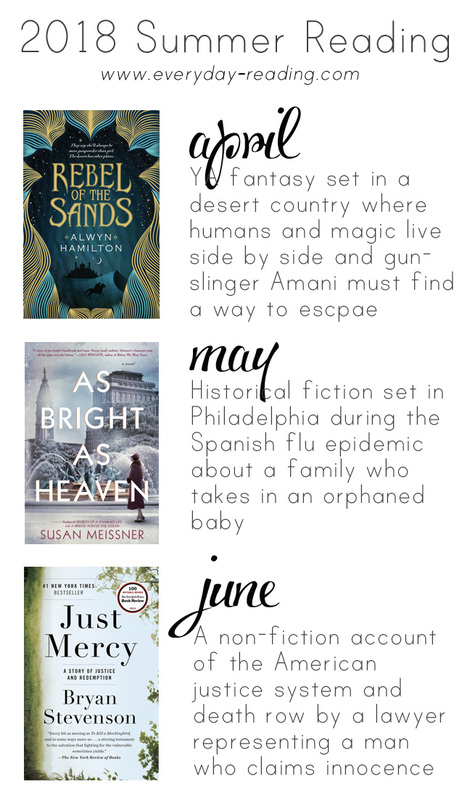 I’d read some of the books that recommended and I’ve listed those ones here, along with a link to a review if I’ve talked about it on my blog! I’m so excited to hear what you think about Just Mercy. When I recommended it, I hadn’t finished it yet, but now I have. It continued to be excellent, and I’ll be surprised if it’s not in my top five books at the end of the year. Well, I’m all in now! Just Mercy is SO good, and incredibly eye-opening. Our book club read it last year, talked about it late into the night, and have related it to so many different discussions we’ve had since then. Ah, this makes me wish for a book club that reads contemporary books so much! Do you remember when we read Justice for book club? That is still one of my favorites. I’m adding Just Mercy to my TBR list. I read Secrets of a Charmed Life, so the new Susan Meissner interests me too. I’m almost done with Before We Were Yours…looking forward to hearing what you thought about it. That was actually one month before I joined! But I went back and read it because the whole bookclub all raved about it so much! I started reading As Bright As Heaven a couple nights ago and I’m loving it so far! It’s beautifully written. I found you because of the Healthy Mom Summit. I just finished As Bright As Heaven and then read Eleanor Oliphant is Completely Fine. They were both great for different reasons! I’m a huge reader, and it’s funny, my maiden name is Bradshaw! I’ve been following Merrick for years because I’m big into sewing, but I will have to follow along for book recs from you now!